How Do You Find the Size of a House? 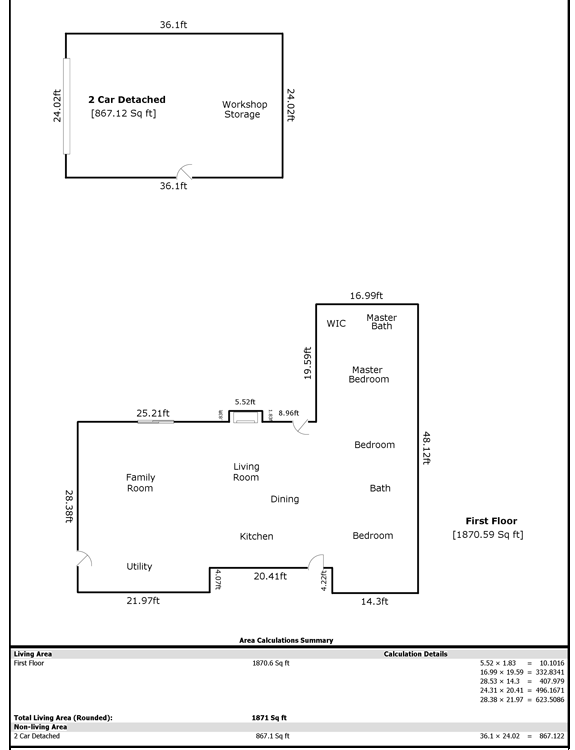 In post 1 (Determining the Square Footage of a House) in this series of 3 posts about how to calculate the square footage of a house, we discussed the most basic aspects of measuring a house. 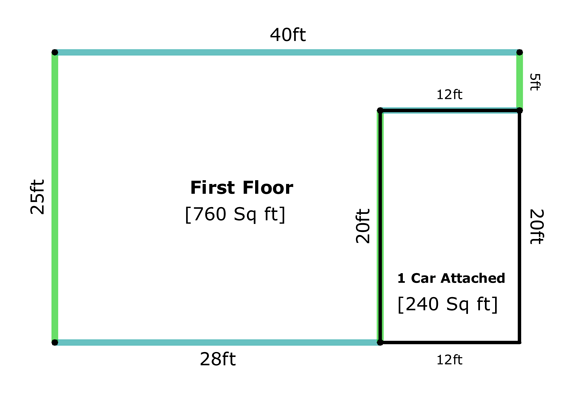 We covered measuring a house that is a simple rectangle without a garage, and illustrated the difference a slight variation in the length of one wall might make when calculating square footage. Garages are not considered to be interior living space, and are therefore not counted as part of the square footage of a house. In an appraisal, garages are still measured, and are clearly marked as being garages, which indicates that they are not living space (i.e. not “GLA”, or “Gross Living Area”). A detached garage will still be shown on the property sketch. 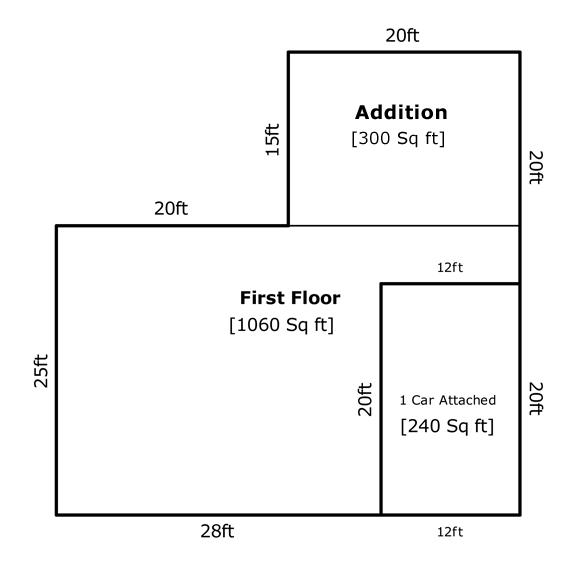 For this example, we will show how to calculate the square footage of a house that is a simple rectangle with the garage taking up part of the overall footprint within the rectangle. This type of home can be measured with a long measuring tape and does not require the use of specialized measuring tools. This next house looks a lot like the last one, except the owners have built an addition on the back. This addition is 300 square feet (15 feet by 20 feet). 760 square feet + 300 square feet = 1060 square feet. This house has 1060 square feet of interior living space. In reality, we wouldn’t do it this way. We would use our sketching software to draw the diagram of the house and the software would calculate the dimensions. For a simple house like this, that might sound like overkill. We rarely see a house this simple! Most of the houses we measure have all sorts of angled areas, and bump outs, and stuff that makes calculating the square footage of a house a real headache. This is why we offer a home measuring service. It’s just not fun to measure anything more complicated than these simple examples unless you have a lot of experience. It’s even less fun when it’s in the high 90s in Texas in the summer. Don’t say we didn’t warn you! enclosed patios that are heated and air-conditioned and are similar in workmanship (quality) as the original dwelling. If it still looks like a patio, it probably IS still a patio, and you’ll need to have a licensed appraiser “make the call”. What is NOT Included in the Square Footage of a House? These spaces may be determined to add value to the property upon analysis of the comparable properties in an area, but they are not included in the square footage. Some spaces, such as a finished basement, may add value, but at a lesser rate than other finished (above-grade) spaces. Measuring a house with a detached garage is actually a little easier – both the house and the garage are measured separately, and their sizes are calculated separately. 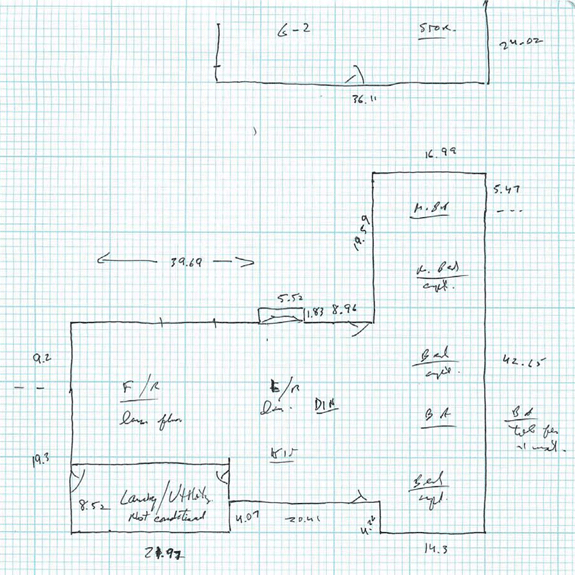 Here is a sketch of a home with a detached garage, along with the calculations from the software we use for determining the size of the home and the garage based on our measurements from visiting the property. In the next post, we’ll take it up a notch and show you how to calculate the square footage of a two-story house. After that, it gets messy, FAST. We’ll show you some sample sketches on paper, and the end results of those sketches when they’ve been entered into our sketching software which is really nifty stuff. If I have a heated storage area that is accessible from the front porch, next to the front door can this count as the sq footage of the house. Do you include interior wall space?